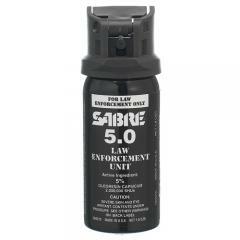 Stop criminals in their tracks with the proven power of Sabre's 5.0 MK-3 DPS 2.0 oz Cone Spray. The sprayer's potent formula boasts a 10% OC concentration with .67% major capsaicinoids capable of instantly immobilizing the most aggressive combatants. The fast-acting spray is designed to immediately inflame and attack the sensitive membranes of the eyes, lungs and nose to leave assailants temporarily blinded and gasping for air. A specialized duel propellant system combines Dupont's Dymel134a propellant with nitrogen gas to deliver a concentrated spray in any environment. The canister has a high-volume nozzle the delivers dense cone style spray bursts that ensure maximum area coverage with minimal aiming.